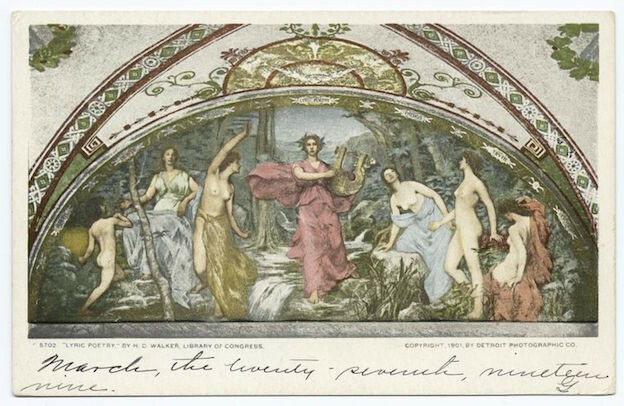 Print of ‘Lyric Poetry’ by H. D. Walker, a mural in the Library of Congress, which appears as a Detroit Publishing Company postcard. Via Wikimedia Commons, courtesy of the New York Public Library. Those interested in theorizing lyric must tread lightly these days, for a great deal of recent critical energy has been invested in sounding the historical and interpretive contours of this “super-sized” modern genre. Much of this work seeks to disrobe lyric of its transhistorical pretensions, revealing by way of materialist critique that what we took for an enduring genre is actually a product of deeply codified — and distinctly post-Romantic — reading practices. Thus when we attempt to write “the history of the lyric,” as Virginia Jackson explains, we are confronted primarily with “the history of the ways an idea has become a genre and the ways in which that genre has been manipulated by poets and critics alike.” The task of responsible lyric scholarship, then, is to “render the intricate turns in the history of the lyric or of ideas associated with lyric” and thereby “testify to the tremendous malleability of the term.” This essay attempts to identify one such “turn” in lyric’s history — a twentieth-century or media technological turn — but it also quite recklessly courts this same historicist critique by suggesting a tentative definition for the transhistorical lyric; or, to hedge only slightly, a definition of one function the poems in the Western literary tradition we have hitherto called ‘lyric’ seem to perform, and to perform well: lyric poems index the phenomenal present. In making a claim for this distinctive capacity of lyric, I rely on a few prominent theorists who also see fit to argue for the validity of a live and persistent (if always dynamic) lyric tradition, and who not only emphasize the genre’s special relationship to the present, but do so partly by identifying the constitutive role of deixis in lyric. Deictics, about which I’ll have more to say below, are those little indexing words like this and that (demonstratives), here and now (spatial and temporal adverbs), and you and I (personal pronouns) that “refer to a present situation of utterance and its speaker rather than to a fixed object, concept, or reality.” According to Jonathan Culler, “the importance of such deictics as technical devices in poetry can scarcely be overestimated,” for they “bring into being a voice and a force addressed.” Roland Greene concurs: “lyric must rely on deictics to maintain and adjust its internal process, to found fictions.” “Whenever we use the terms now or here or I or you,” observes Susan Stewart, “we find ourselves immersed in the ‘now’ of articulation, the ‘here’ of the space in which speech is spoken, the ‘I’ of the speaker, the ‘you’ of the listener. It is … not just that such terms are context-dependent: they themselves define and create the circumstances of specific contexts.” By virtue of their “paradoxical” ability to establish a totally particular context (‘now’ meaning 1:37 pm) and simultaneously retain meaning across various contexts (‘now’ meaning nowness), deictics are largely responsible for lyric’s capacity to image speaking persons that are intelligible for different readers, and across time — that is, to create iterable effects of presence, “one of the fundamental possibilities” of the genre. The indexing to which Culler, Greene, and Stewart refer can be described as rhetorical in nature, which is to say it bears upon the address of a lyric speaker — to absent listeners, for example, or readers, or wind, or the speaker’s own self. But I’m here to contend that one of the legacies of poetic modernism — a legacy that maintains an as yet undertheorized relationship to emerging media technologies in the twentieth century — is the removal of lyric’s indexical capacity from the dimension of rhetoric to that of language-in-use, the poetic medium itself. Many twentieth-century poetries — beginning in English perhaps with the Imagist experiments but more evidently in successive avant-gardes — abjured or subverted the “pronominal forms,” modes of address, and discursive impulses associated with lyric exemplars of the past, but precisely on account of this shift of emphasis from a presencing rhetoric to a presencing language, the short poem’s ability to make present did not disappear. As a result, those poetries we’ve termed ‘anti-lyric’ or ‘avant-garde’ because they sought to explode any number of received Romantic or ‘lyric’ values (like formal integrity, expressive subjectivity, an orientation toward speech, etc.) may prove less anti-lyric than we supposed. After modernism we can observe a tendency among poets to avoid the rhetorical devices upon which lyric had hitherto relied for effecting presence, and instead, to avail themselves of speech’s own debt to deixis, its indexical dimension, thus managing still to foreground the present situatedness and relatednesss of speaker, listener, or reader. According to this hypothesis, we find in the wake of poetic modernism not an entirely different valuation of lyric — for these lyrics are still doing what we know lyrics do well — but rather the discovery of a different site of lyric activity: language’s absolute dependence on the phenomenon of indexicality, and its ceaseless presupposition of presence. This is lyric by other means, and all language is lyric language now, or so we’ll have reason to suspect. As I attempt to delineate the nature and stakes of this indexical lyric, I must sideline the essential questions of when exactly this modern lyric impulse arose, of what poets precisely it attracted, of its relationship to existing accounts of poetic modernism and to theories of poetic signification like those of Heideggerian phenomenology and de Manian deconstruction, and of its continuing significance for poetic makers today. Though clearly, if the argument below stands up, it will not stand for long without serious answers to these urgent questions. In the meantime, I offer the preliminary example of George Oppen, a poet whose abiding concern for the phenomenological present and whose innovative resistance to the expressive model of lyric credit him as an especially helpful guide to this new lyric present. On April 9, 1964, George Oppen gave a reading with David Ignatow at the Guggenheim in New York for the recently inaugurated reading series of the Academy of American Poets. The recording of the event is one of the earliest in the Academy’s now extensive audio archive, the establishment of which the previous year signaled an important shift in the organization’s mandate: while the Academy’s stated mission since 1934 had been to promote contemporary American poetry, in this audio archive we see a new tandem interest in preservation as well, an interest amplified by the decision to house the new reading series in the impressive new modern art museum. Indeed Oppen is picking up on this institutional impulse for preservation when, by way of excuse for including in his reading several poems from his first book, 1934’s Discrete Series, he quips: “I also decided to give myself a retrospective at the Guggenheim” (7:42). It’s a joke trimmed with poignancy though, for after Discrete Series Oppen did not publish another book for twenty-eight years — years of political action, military service, and exile in Mexico. One wonders, then, for whom in his 1964 New York audience was Oppen still something of the prodigal poet, returning to avail himself of the engaged art that as a younger man he had abandoned, attempting now and again to wield, as he speaks in “A Narrative,” the poem with which he opens his reading, “a substantial language / Of clarity, and of respect” (7:20). We hear in this recording the effects of a markedly overdetermined concern with presence, a concern enforced by prerogatives institutional, technological, and poetic. Firstly, the Academy of American Poets and the Guggenheim are institutions whose mandate is the documentation of the historical-aesthetic present, the contemporary, and in this case, of the presence of the poet’s embodied voice, a voice returned lately to the scene of American poetry “as from the dead.” Secondly, I’ll propose we consider audio recording itself a “technology of presence,” a term employed by Michael Davidson to describe “those systems of production and reproduction within which the voice achieves enough autonomy to regard itself as present unto itself.” The speech sounds inscribed by a technology of presence deliver “a hybrid voice,” one that effects the presence of a speaker by re-presentation, but also “deconstructs” or gives the lie to presence via the necessary intercession of the machine, registering the extent to which presence is only ever an effect. Finally, I’ll suggest that lyric poems like those written and read out by Oppen are also technologies of presence, though they do not require tape recording or any media supplement beyond speech to be counted as such. Indices rather than poems. We need not subscribe wholesale to Kittlerian media theory in order to see the wisdom and utility of this particular claim. When Kittler distinguishes between indices as real impressions and poems as symbolic constructions, he draws upon the semiotic system of Charles Sanders Pierce, for whom the index, as opposed to the symbol or icon, “is a real thing or fact which is a sign of its object by virtue of being connected with it as a matter of fact and by also forcibly intruding upon the mind, quite regardless of its being interpreted as a sign.” Debate persists among critics over the precise nature of this “connection” between indexical sign and referent. Is it necessarily physical, or temporal, and how reliable is this connection? All agree in any case that the index, in Kris Paulsen’s words, “has a real and necessary connection to what it signifies, unlike the symbol’s arbitrary connection.” Photographs, footprints, weathervanes, ‘index’ fingers, and disease symptoms are all emblematic indices, evincing a “real and necessary” — that is, a nonarbitrary — connection to what they purport to signify. For Kittler, then, Wildenbruch’s recording, as a result of the “real and necessary connection” secured by phonography’s mode of mechanical inscription, produces not the poem “For the Phonographic Recording of His Voice,” but an index of the phonographic recording of his voice and everything else registered by the machine in the moment of utterance, noise included. When phonographic records begin spinning, Kittler observes, “the death bell tolls for poetry.” But as indicated above, lyric poems have always maintained an indexical function, one on which they rely for their effects of presence. If these two indexical capacities — the way phonography, as a technology of presence, establishes a “real and necessary connection” between playback and original sound, and the way lyric deixis presupposes a present of utterance — can be thought together on mutually agreeable terms (such is our task here), then perhaps we have a case not of poetry’s death-by-media, but of something more like competitive negotiation; technological media have outstripped lyric with respect to the latter’s foremost cultural function, the indexing of the presence of persons across time. 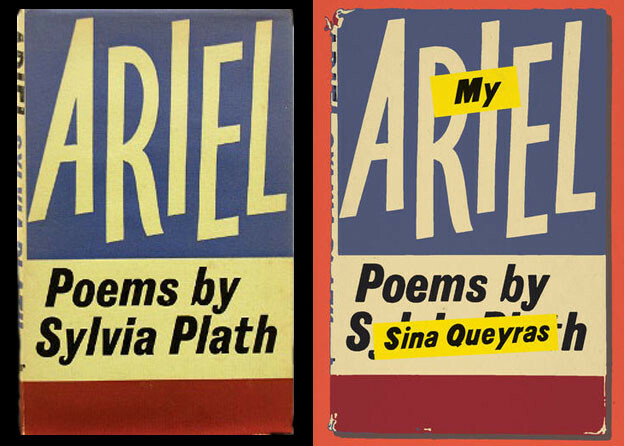 How did twentieth-century lyric poets and their readers respond to this altered media environment? Perhaps by rethinking how poetic language might go about effecting presence in the first place. A poetics like Oppen’s, I argue, signals a retooling of lyric’s relationship to speech or language-in-use, and the charging of that lyric language with some distinctly phonographic aspirations. Well, that the nouns do refer to something; that it’s there, that it’s true, the whole implication of these nouns; that appearances represent reality, whether or not they misrepresent it: that this in which the thing takes place, this thing is here, and that these things do take place. On the other hand, one is left with the deer, staring out of the thing, at the thing, not knowing what will come next. In holding fast to the belief that his “small nouns” can in fact “identify [their] object and assure us of its existence and presence,” Oppen espouses an explicit “faith” in indexicality, in the nonarbitrary or “real and necessary” relation between word and world. The poet himself “cries faith” in language’s capacity, guaranteed only by “the existential presence of a given speaker,” to point to reality, to throw up a temporary bridge over the abyss sundering sign from referent. Oppen’s allowance in the above quotation for “misrepresentation” may seem odd at first, particularly for so conscientious a poet, but in fact it argues his refusal to privilege the symbolic over the indexical. The achievement of this poem lies not in its representation — what the poem points to — but, more basically, in its capacity for reference to the world outside the poem — the fact of its pointing at all: “that the nouns do refer to something.” To be sure, “Psalm” means symbolically as well, but its indexical force remains indifferent to semantic content or representational accuracy. Not right or wrong, but real. In distinguishing between the symbolic and indexical modes that work alongside each other in lyric, we can borrow the useful reminder issued in a different context by Paulsen to those visual theorists who would confuse the indexical and iconic modes: the index is not a “mark of resemblance, proof, or truth, but rather … an instance of relationality, interpretation, and decision.” Elegantly, passionately, “Psalm” demonstrates the indexical fact of this relationality: “they are there,” we are here, and there exists on faith a “this in which” we both are. But to understand exactly how it is that these “small nouns” perform their indexical function, how this results in persuasive effects of presence, and how such effects differ from those made possible by the rhetorical maneuvers associated by Culler, Greene, and Stewart with familiar lyric protocols, we need to pop the hood, as it were, of this poetic language by recourse to the lessons of pragmatic linguistics. In his 1976 essay “Shifters, Linguistic Categories, and Cultural Description,” linguist and anthropologist Michael Silverstein sets out to describe “the elaborate meaning structures of speech behavior” that are left underanalyzed by traditional grammatical or “semantic” (or symbolic, in Peirce’s terms) approaches to the study of any culture’s linguistic behavior. The “key” to such a functional and “pragmatic description of language” is the index. In the course of his argument Silverstein discloses the subtle machinery of signification at work in that type of index most germane to our discussion, the deictic, also known as a variety of “duplex sign,” “referential index,” or “shifter,” because the word’s “reference ‘shifts’ regularly, depending on the factors of the speech situation.” These deictic utterances operate, Silverstein explains, via a logic of “presupposition.” Take the phrase ‘this table,’ for example, uttered in the course of conversation. The deictic ‘this’ “presupposes” either the “physical existence” of something called ‘table’ or a “prior segment of referential discourse” in which this thing called ‘table’ has been spoken out. It’s an act of taking-for-granted, and “the use of the deictic … is maximally presupposing” in so far as “some aspect of the context” must be “fixed and presupposed … in order for the referential contribution to be made,” that is to say, in order for the words to refer at all. And crucially, the presupposition of this referent — be it a table, a person called ‘you,’ etc. — also entails the presupposition of “the speaker or hearer location” relative to that referent. So the phrase ‘this table’ not only presupposes the existence of furniture in the world or in recent discourse, but also something of a person’s relative proximity to that furniture, for the deictic is as much about where we are — where I am relative to ‘this,’ where ‘you’ are relative to me — as it is about the existence of any particular referent. Indeed, deictic phrases draw us into an awareness of presence by making the fact of our position with respect to an entity a precondition for meaning-making. A “plunge” indeed, from the very heights of meaninglessness, of language unanchored to any relational context, to the hard ground of meaning and reference — this on which one stakes a social life. The speaking out of “things” with those “words that mean nothing” — this is a passionate act inextricable from the speaking out of oneself, because the deictic utterance presupposes our own presence in the same gesture as it presupposes its object of reference. No description, no matter its vividness or expressive detail, will reveal to me where I am unless that reference is anchored in the “plunge” of deixis. By contrast, when Oppen speaks, or when we speak Oppen’s bald words, “They who are there,” I cannot forget where I am: I am at the other end of a pointing finger, and thereby made present to this act of reference. That there is something for us to stand on. The index is how the poet reaches for this ultimate ground of reference, and the reader too is invited — nay, obligated by the logic of presupposition — to stamp her feet, so to speak, in search of this “something for us to stand on.” If like Davidson we characterize a technology of presence by its ability to make one present to oneself, just as a tape recorder plays back one’s own voice, then deixis, which effects an experience of the lyric reader’s situatedness among others, affords the reader a handle on that same necessary distance or estrangement. “There are things / We live among ‘and to see them / Is to know ourselves,’” the poet begins his great 1968 long poem, “Of Being Numerous,” recorded at Long Island University in 1966 (1:06). We might understand “see,” in this case, as Oppen’s shorthand for index. Oppen may be our great poet of the index for how firm and fast he pledges his art to the empty deictic’s indexical capacity, for how adamantly he refuses the pull of the narrowly semiotic, fictional, impersonal, and rhetorical, and for how he restores to twentieth-century poetry, under the newer auspices of indexicality, the cultural work of lyric presencing. But the indexical lyric neither begins nor ends with Oppen’s magisterial example. All language, I proposed at the beginning of this essay, is lyric language now. Such a claim sounds either banal or preposterous until we register the fact that indexicality actually undergirds all speech behavior. In the guise not only of demonstratives and adverbs, but as pronouns and verb tenses too, indices constitute “the ground floor of the semiotic architecture whereby language allows users to talk about specific ‘things,’ including each other.” Pointing and presupposing, positioning and presencing: this is what speech must do to mean in the first place. Lyric language, then, is language becoming aware of its utter dependence on the ceaseless presupposition of a speaker’s presence. Thank you to Tom McEnaney for his very helpful response to an earlier draft of this essay, and to the Jacket2 editors for their excellent guidance in the revision process. 1. Virginia Jackson and Yopie Prins, eds., The Lyric Theory Reader: A Critical Anthology (Baltimore: Johns Hopkins University Press, 2014), 452. For a useful review of the “New Lyric Studies,” I suggest Stephen Burt, “What Is This Thing Called Lyric?,” Modern Philology 113, no. 3 (2016): 422–40. 2. Jackson, “Lyric,” in Princeton Encyclopedia of Poetry and Poetics: Fourth Edition, ed. Stephen Cushman and Clare Cavanagh (Princeton: Princeton University Press, 2012), 833. 4. Noam Pines, “Deixis,” in Princeton Encyclopedia of Poetry and Poetics: Fourth Edition, ed. Stephen Cushman and Clare Cavanagh (Princeton: Princeton University Press, 2012), 344. 5. Jonathan Culler, Structuralist Poetics: Structuralism, Linguistics, and the Study of Literature (Ithaca: Cornell University Press, 1975), 165–66. 6. Roland Greene, Post-Petrarchism: Origins and Innovations of the Western Lyric Sequence (Princeton: Princeton University Press, 1991), 32. 7. Susan Stewart, Poetry and the Fate of the Senses (Chicago: University of Chicago Press, 2002), 150. 8. Ibid. ; Culler, Theory of the Lyric (Cambridge: Harvard University Press, 2015), 16. 9. W. R. Johnson, The Idea of Lyric: Lyric Modes in Ancient and Modern Poetry (Berkeley and Los Angeles: University of California Press, 1982),7. Johnson’s study of ancient Greek lyric and its relationship to modern poetry makes a case for the “centrality of rhetoric for lyric”: “What is essential, then, to lyric is rhetoric, and essential to this lyrical rhetoric … is the pronominal form and lyric identity, the dynamic configuration of lyrical pronouns that defines and vitalizes the situation of lyrical discourse” (38, 23). 10. Here I’m shamelessly indulging the critical habit of “lyricization” as defined and forcefully critiqued by Jackson and Prins: “a process that began before the Romantics and continued long after them” by which “stipulative verse genres that once belonged to neoclassical taxonomies or to certain communities or to specific modes of circulation gradually collapsed into a more and more abstract idea of poetry that then became associated with the lyric. The audience for that more abstract, lyricized poetic genre eventually became literary critics, as professional reading practices displaced popular or local verse reading practices.” Jackson and Prins, “Avant-Garde Anti-Lyricism,” The Lyric Theory Reader, 452. Perhaps somewhat perversely, the present argument risks complicity in this long project of abstraction precisely in service of a richer historical-materialist account of modern poetry and its twentieth-century means of signification. If I unduly “lyricize” in my embrace of an abstract lyric category via one low-bar sine qua non (that is, lyric’s capacity for indexing the phenomenal present), I do so in hopes of better understanding the specific transformations undergone by poetry’s cultural work of presencing alongside other transformations in the greater media environment. For a persuasive response to the “lyricization” argument, see Jonathan Culler, Theory of the Lyric (Cambridge: Harvard University Press, 2015), 84–85. 11. In Peter Nicholls’s terrific discussion of modernist lyric, Oppen serves as one example, alongside Susan Howe, of poets who have “made their work a register of the constraints and limits of the lyric mode.” Nicholls, “Modernism and the Limits of Lyric,” in The Lyric Poem: Formations and Transformations, ed. Marion Thain (New York: Cambridge University Press, 2013), 187. 12. This recording is available to us digitally via PennSound, which boasts a robust collection of audio Oppen. 13. George Oppen, New Collected Poems (New York: New Directions, 2002), 156. 14. Oppen, The Selected Letters of George Oppen, ed. Rachel Blau DuPlessis (Durham: Duke University Press, 1990), 129, qtd. in Peter Nicholls, George Oppen and the Fate of Modernism (Oxford: Oxford University Press, 2007), 4. 15. Michael Davidson, “Technologies of Presence,” in Sound States: Innovative Poetics and Acoustical Technologies, ed. Adalaide Morris (Chapel Hill: University of North Carolina Press, 1997), 99. 17. Friedrich Kittler, Gramophone, Film, Typewriter,trans. Geoffrey Winthrop-Young and Michael Wutz (Stanford: Stanford University Press, 1999), 79. 18. Kittler, “The God of the Ears,” in The Truth of the Technological World: Essays on the Genealogy of Presence,trans. Erik Butler(Stanford: Stanford University Press, 2014), 48. 19. Kittler, Gramophone,78, 12, 24. 20. Kittler, Discourse Networks: 1800/1900,trans. Michael Metteer and Chris Cullins (Stanford: Stanford University Press, 1990), 236. 22. Charles Sanders Peirce, Collected Papers of Charles Sanders Peirce 3/4 (Cambridge: Belknap Press, 1960), 359, qtd. in Kris Paulsen, “The Index and the Interface,” Representations 122, no. 1 (2013): 94. 23. Paulsen, “The Index and the Interface,” 86. 25. Burt Kimmelman, “George Oppen’s ‘Psalm’: Manifest Things and a Poet’s Words,” in “All This Strangeness: A Garland for George Oppen,” ed. Eric Hoffman, Big Bridge 14 (2009). 26. Richard Swigg, ed., Speaking with George Oppen: Interviews with the Poet and Mary Oppen, 1968–1987 (Jefferson, NC: McFarland, 2012), 7. 28. Peirce, Collected Papers, 359. Nicholls offers a deeply instructive account of these indexical “small nouns” and their relation to Heideggerian “pointing” in his George Oppen and the Fate of Modernism, 73–74. 29. Rosalind E. Krauss, The Originality of the Avant-Garde and Other Modernist Myths (Cambridge: MIT Press, 1985), 198. 30. Paulsen, “The Index and the Interface,” 95. 31. Michael Silverstein, “Shifters, Linguistic Categories, and Cultural Description,” in Meaning in Anthropology, ed. Keith H. Basso and Henry A. Selby (Albuquerque: University of New Mexico Press, 1976), 11, 19. 38. Oppen, New Collected Poems, 144. 42. Asif Agha, Language and Social Relations (Cambridge: Cambridge University Press, 2007), 37–38. 43. Oppen, New Collected Poems, 110. What is the place of lyric in modern and contemporary poetry?